How do start-up companies begin? It's different for everyone. For some people, having lots of brilliant ideas is just what they do, and sooner or later one of them is brought to fruition. Some people polish their single idea for many years before finally finding the resources to bring it to life. For some, it's happenstance. I'd always assumed I wouldn't be working for someone else forever. At the same time the day when I was supposed to start my own business had always stayed somewhere in the hazy future. In the "now", I had my studies and my job where I was steadily moving up the career ladder. I had already risen from a simple padawan to art director. Around that time I spent my vacation in an unusual company for me. Everyone was (high up) in their careers, most had their own businesses. They were older and more experienced, and seemed to be where I always wanted to get. I asked one of them how old he was when he became the CEO of his own company. He thought about it a bit and said, "26". "I'm already 27," I thought, somewhat dismayed. "What am I doing wrong?" I returned from that vacation certain that I needed to get moving right that moment, or else it was going to be too late. I didn't really know what it was exactly I needed to do, how to start doing it, or what hardships were waiting ahead. I just realized all of a sudden that was the deciding moment. Unless I did something right that day, that minute, all of my dreams were going to stay just that. Dreams. I repeated these thoughts to a friend that very evening. At the time he was working as a project manager on a social networking project. "Look," I said. "We have to open our own studio." "Yeah, that would be nice, maybe someday we could..."
"No, no. Not someday. Now. I want to start today. You with me?" "Errrhmmm... Ah, why not! I'm in! Our own studio! Great idea! We found a developer a few days after that. He had an idea he'd wanted to do for some time, but couldn't find like-minded people. We let him know our plan to take the gaming industry by storm and he agreed to do it with us. That was the beginning of OWL-Studio, although at the time it didn't have a name, or, God forbid, a business plan, timelines or any intelligible ideas on what's next. The next few month were probably the best, most laid-back months of the studio's existence. We met after work to talk about ideas and plans, think more on the story that will later become One Day in London, draw gameplay schemes in our notebooks and come up with names for the characters. First signs of actual teamworks emerged in the form of the Google-Doc with the project's despription, and the team Dropbox with the references and sketches. The first problem I encountered was when I tried to move beyond words. It was nice to sit in a bar with friends and dream about making an amazing, awesome game, but to actually come home after work and do more work - not to mention unpaid work - instead of watching TV-shows and spending time with my family... Even though it was our own idea and our own business, even I had a hard time convincing myself to do something. It soon became evident that it's impossible to combine a senior managing position at work and manage my own business at the same time. I had to choose. I chose to pick up my old freelance voodoo and quit the art director job. Thankfully I still had some connections and was able to choose my own pace to work. Our novel began to grow past its bare bones. We had first sketches, user story storyboards, interface mock-ups, and the very first demo-version that transported the player into a location and allowed them to... stay in it. It was then we met a marketing manager. She was energetic and efficient, and had a lot of experience in matters we didn't even consider. Most importantly, she had an idea of her own and wanted a team to help her with it. We showed her ours, she told us about hers, and we decided we were going to be great together. The studio was becoming more structured. We came up with the name (the novel was tentatively called One Week in London at the time, and its acronym was OWL). Then we applied to register the brand, bought Jira for 10 users, filled it with tasks and started to get ready for our first conference - DevGamm in Moscow. During that time I realized the second problem in creating my own studio - becoming the boss of my own friends. We had our first deadlines and commitments, but it was hard to insist my friends meet those deadlines, especially when they didn't get paid for their work. They were working pro bono on enthusiasm alone. It's especially hard for women. Then we had our first casualty - the project manager had decided to "stay friends" instead of continuing. Nevertheless, the morning of May 15th, 2016 found us around our table at the DevGamm showcase, nervous and frazzled. The studio not only had a title, but a proper website with a description of our project, corporate email, business cards. Our demo version included several locations, a video clip and the first mini game where the player needed to sketch runes. The DevGamm conference was probably one of the key moments in the studio's development. It was only there I formulated what we're doing and why, what are our risks, and what we can do to minimize them. After the conference our hobby club finally turned into a real start-up. Part 2. From idea to business. So DevGamm was over, and with it the first shock of coming out to play at the industry playground, so to speak. We could see our problems and our potential. Problem #2. Resources. It was great to have enthusiasm, but as a resource it wasn't much, and we couldn't count on the results. For turning the situation around we needed money, to officially employ everyone as permanent employees, not part-time workers. Problem #3. The visual novel, obviously! We started more or less with a pile of half-formed ideas. The genre of the project was still undecided at the time - it was maybe an adventure game or maybe a quest, with some maybe HOG elements and quests (wait, I said that already). After DevGamm it became apparent neither a quest nor a HOG were right for us. The former because we didn't have a game designer on board or resources for developing it, the latter because as an artist, I'm against HOG. I'll get back to it later. Okay, so we realized that we were creating a visual novel. Our developer colleagues reacted with different words but the same sentiment: "All of you should see a shrink." During that time I was lucky enough to meet my future business partner. He wasn't working in the game industry before that (if you don't count organizing 40-people dungeon raids in WoW), but he had what we were lacking - business experience and high analytical skills. He was interested, more in our potential as a team than the project. Together we created a business plan that helped to solve all of the aforementioned problems. 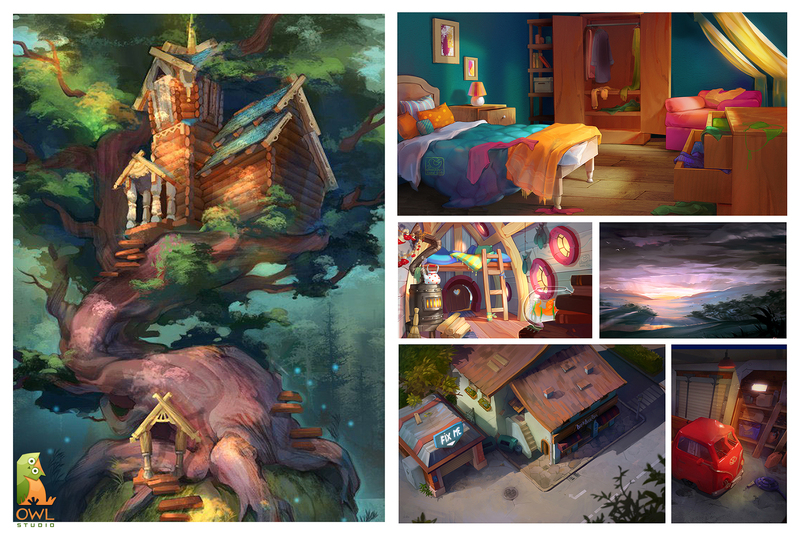 We decided to use our strongest asset as a base for the studio's development and a source of people to work on our novel - artists. My freelance contacts helped with it, as well as artists' contacts I've accumulated during the years. Some time later I created my own art blog on Vkontakte. It quickly became popular as an informative and educational portal for artists. I regularly did online workshops. wrote articles and posted my own work. In time the blog helped me to not only find good candidates to work with, but also to create and maintain a reputation of a sought after artist. There are several reasons why we chose Unity. First and foremost, our programmers had already been highly skilled in C# development, therefore we believed we would face fewer complications while working on the project. Fourth, a large and tight-knit community of developers played an important role. There’s a great amount of documentation and expertise, which allowed us to easily find answers to any questions, while working on “One Day in London”. There are so many people willing to help and to give so much feedback, that a project is progressing in a friendly stress-free atmosphere. This is good. No project development process is ever absolutely flawless, and so was ours. 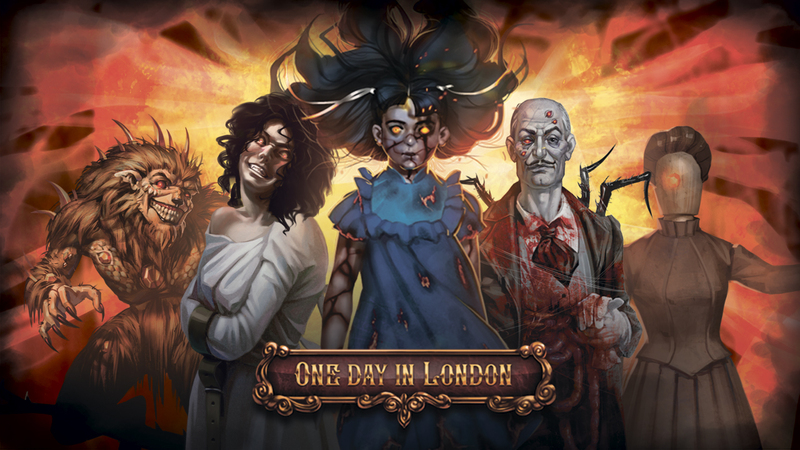 “One Day in London” contains several mini games, which involve drawing with a finger or a mouse pointer, depending on a platform. Our old gesture-recognition technology was based on a standard gesture database. A mini game offered a gesture to be drawn by a player, and compared the result to the database to select the matching one. Then it analyzed, whether it matched the game assignment. This system may bring on a problem. When new gestures are added to the database, they may turn out to be a better match to mini game gestures, than the original ones. Thus, as new episodes are introduced, the gesture recognition may become more complicated in the old episodes. So we came up with a brand new solution, and now we are switching to a new version with a less troublesome system. We now calculate the degree of similarity between the sample and the picture. Now, having launched two novel’s episodes using the Unity engine, we decided to stop using our genuine tools and to imply a special novel engine called Fungus. It is still under development, but the current available version should already be able to facilitate work on “One Day in London”, we assume. For the art part I promised to talk about my refusal to work on a HOG. From an artist's point of view, hidden object games aren't the best genre. It's a technical thing, really, but the short version is that HOGs are designed so as to have a location buried in many small objects that can be anywhere. It's a dump. It's absolutely impossible to focus your eye on something. Which is the close up? Which is the distant view? What are the main objects, what is secondary? Secondly, imagine there's a lamp on a table, and a jar under the lamp. The lamp's light is on the jar, which then throws a shadow. Now let's move the jar. What about the light and shadow? Obviously they have to change accordingly. But it can't be done with 2D art - or I'd have to draw every possible variation. In HOGs this problem is circumvented, as objects just don't have any light or shadow properties. You'll say, so what? HOGs exist and are popular, as do many other unfortunate (for an artist) things, and nobody except for artists understands the technicalities anyway. But you can't deceive people. Their brain doesn't really believe in badly-drawn art. Of course art isn't everything that makes a game popular - there's game design, programming, demand, competition, even happenstance. But all other things being equal, if the game has awful art - it'll lose. And the further the industry goes, the more important art becomes. It's a project's display box, its wrapping paper that needs to try harder and harder to attract customers in the competitive field, and just as the product's quality mark. But I digress. Let's get back to work, as it were. Our first two problems were solved. Although I realized something else: responsibility is the killer of enthusiasm. And vice versa, people who like responsibilities can't work enthusiastically... Out of the people we started the project with (the second artist, developer, project manager, marketing manager, some "helpers" that were phasing in and out from time to time), only the second artist survived the Responsibility Trial. After coming to the studio as a full-time employee on a salary she started working with renewed fervor. We had to replace everyone else. Part 3. Why the visual novel? We receive this question so often, the team has wanted to make it our corporate motto on a T-shirt. In the previous parts ("Part 1. The beginning", and "Part 2. From idea to business") I talked about the ide for the project, where it came from, and why in this form. But what is the reason for working on it even today? Why is the project alive and well, past soft launch, released on Steam with the English version available, and why do we plan on three more episodes? The main problem with visual novels in Russia is their nonexistence :) Or actually, lack of quality games of that genre. The genre is widely considered a dead-end, with no prospects of success, so experienced developers just don't work on such games. Most of the russian VNs that manage to get released only support this conclusion. But what exactly is a visual novel? It's a picture book. The gameplay, even the idea is secondary to a good story and great visual component. That is exactly what most russian VNs lack - and that's exactly what makes them sink. Obviously I can say that now, having launched the project and received feedback from players. I didn't believe in the project when we first started, and doubted that it'll bear fruit, monetarily speaking. But I believed in our team and I knew that I would abandon the project only as a last resort, all my critiques notwithstanding. It would have been easy to give up after DevGamm; to decide that the project is a dead-end, abandon it and start something else. However, how much money we would've needed for that? How much back we would've been thrown in our progress as a business? I needed to decide if I want to give up in the face of obvious problems, or to risk continuing and stake everything I had on this. I chose to do all I could but see the project through. We released the novel this spring on Android in soft launch. There wasn't much traffic - we never bought it, up to this day everything we have was done on our own. We had a community on a social networking site Vkontakte with a few hundred followers, a couple reviews in game magazines, but we had enough players - together with those who pirated the game - to look at statistics. After soft launch we did just that and saw that nearly 90% of players finished reading the novel. When my partner and I saw the number, we nearly shi... we reconsidered the project's viability. We hastily rearranged the team's tasks to prioritize the development of the second episode and English localization. Both English and Russian versions of episodes one and two were released on Steam on August 10. Combined wordcount for the episodes is close to 600,000 characters, up to 12 hours of play time. Episode two has three alternative endings. The shortest playthrough is 4.5 hours. Average play time is 6 to 9 hours. As of this moment, 30% of users saw the ending credits, 2.2% got the Paladin achievement - which means they have explored all existing branching storylines. It's too early to say how the project will fare. Not much time passed since release, we've got a long road ahead of us with uncertain future. But what I'm seeing now is that it might be worth to bring your idea to life even if everyone is telling you it's crap. It might be crap, and they might be right about that. But what if? I remember hearing a wonderful quote, don't remember who the author was, but here it is: "The only difference between those who succeeded in their enterprise and those who didn't is that the former didn't give up." Game Industry Veteran since 1994. @Marc Michalik - Any troll can spew negative gas out of their blowhole. I notice that you have a lot of followers. Your newly discovered internet troll-power wisdom must be so attractive.